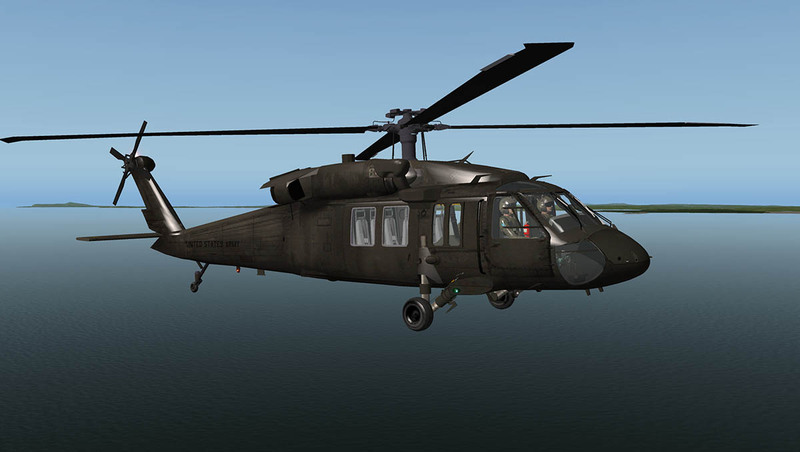 If the UH-1 Iroquois or Huey dominated the 60's and 70's then the UH60 Black Hawk has dominated the 80's, 90's and 2000's and certainly every Hollywood action movie since. 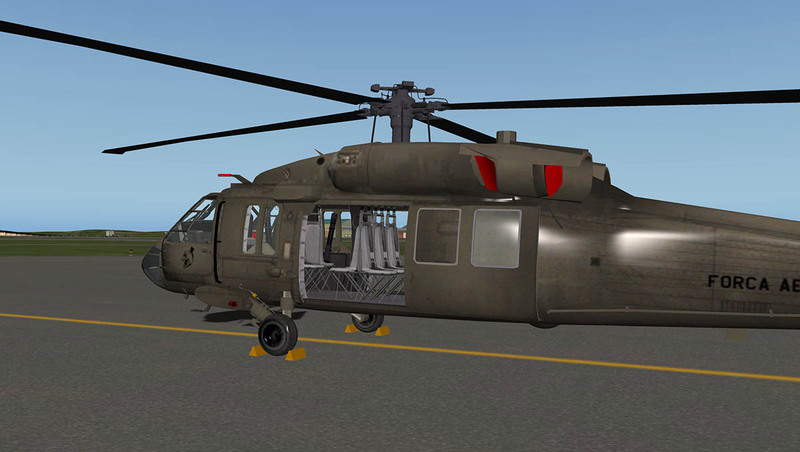 The Black Hawk was the successor to the iconic UH-1 in that the UH-60A entered service with the U.S. Army in 1979 to become the U.S. Army's main tactical transport helicopter. 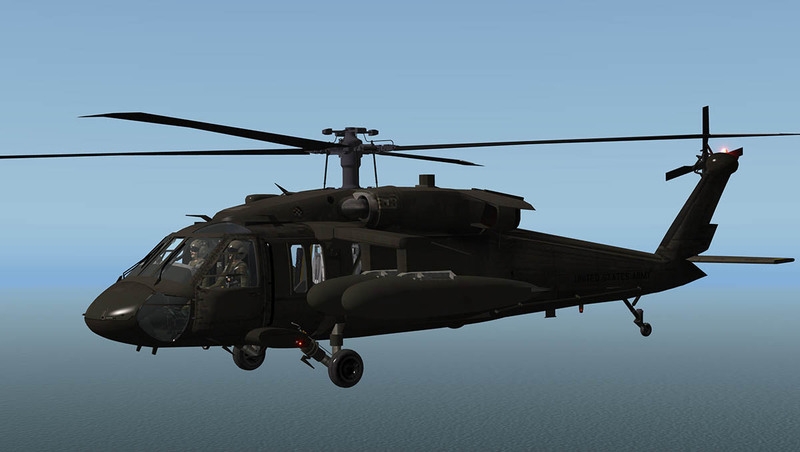 The Black Hawks have served in combat during conflicts in Grenada, Panama, Iraq, Somalia, the Balkans, Afghanistan, and other major conflict areas in the Middle East. 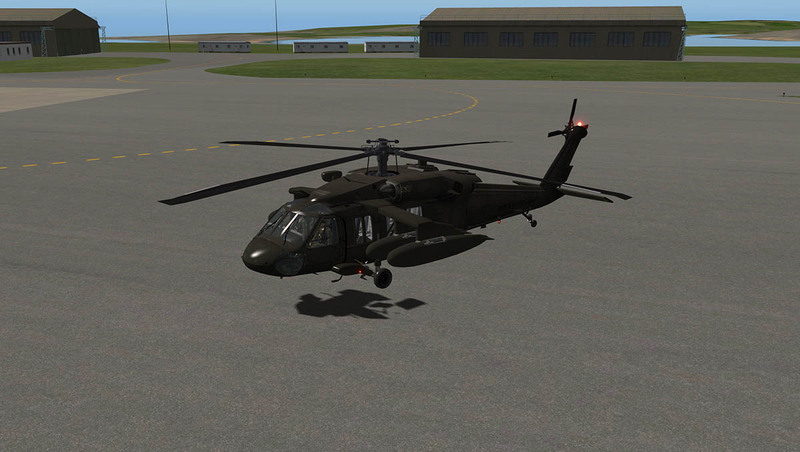 The UH-60 features a four-bladed main and tail rotors, and is powered by two General Electric T700 turboshaft engines. 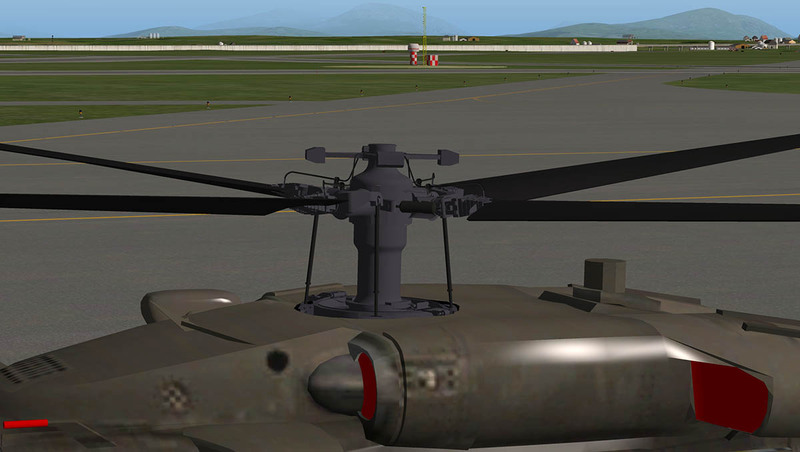 The main rotor is fully articulated and has elastomeric bearings in the rotor head. 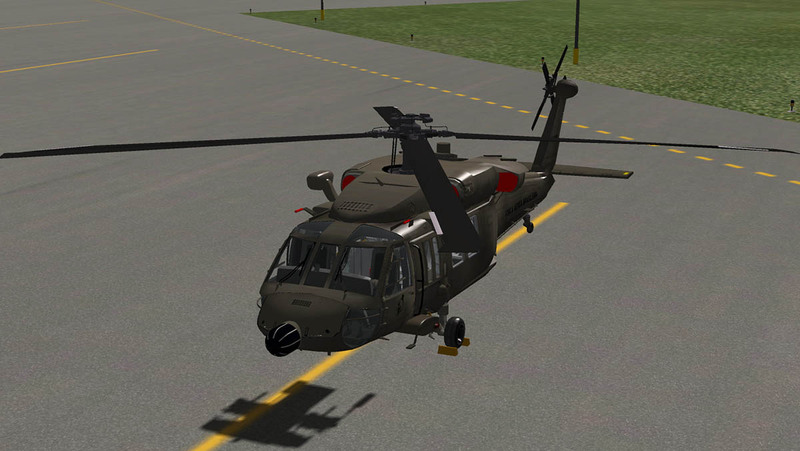 The tail rotor is canted and features a rigid crossbeam. 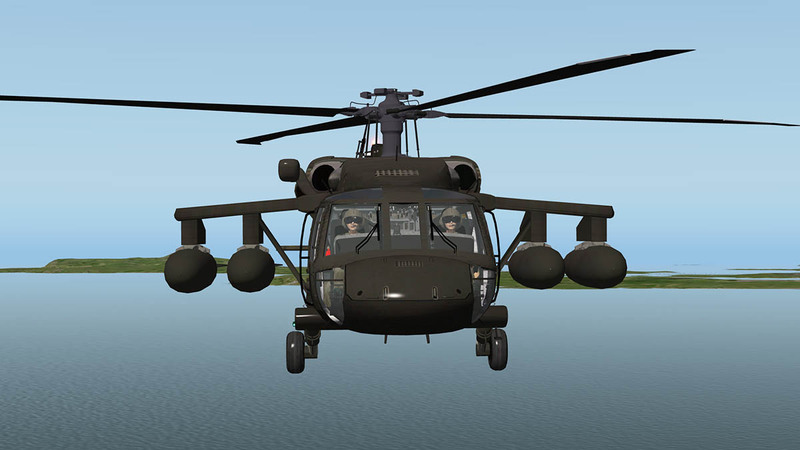 The helicopter has a long, low profile shape to meet the Army's requirement for transporting aboard a C-130 Hercules with some disassembly. 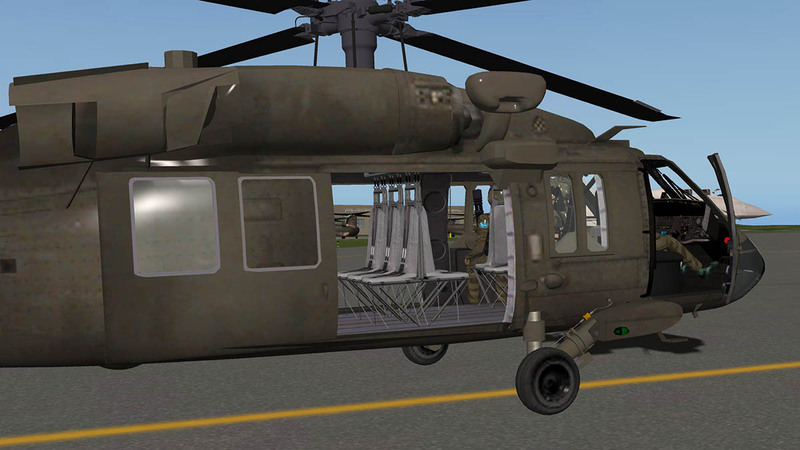 It can carry 11 troops with equipment, lift 2,600 pounds (1,200 kg) of cargo internally or 9,000 pounds (4,100 kg) of cargo (for UH-60L/M) externally by a sling. 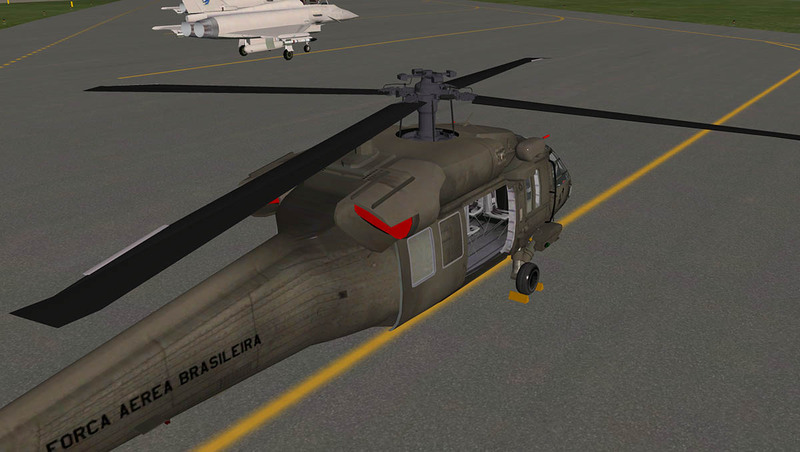 The Brazilian Flightsim Development Group (BFDG) has been around since 2009 and they have produced a few freeware aircraft in the AEROTEC A122B/T23 and in development is the Embraer 312 / T-27 Tucano. 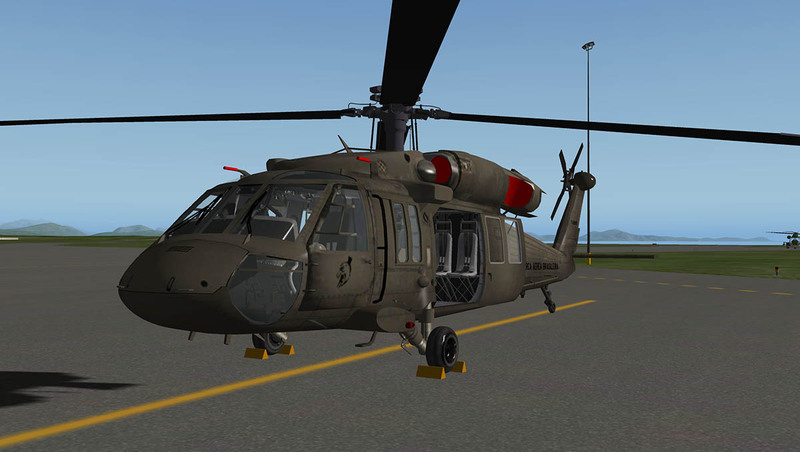 The UH-60 Black Hawk is BFDG's first payware aircraft. 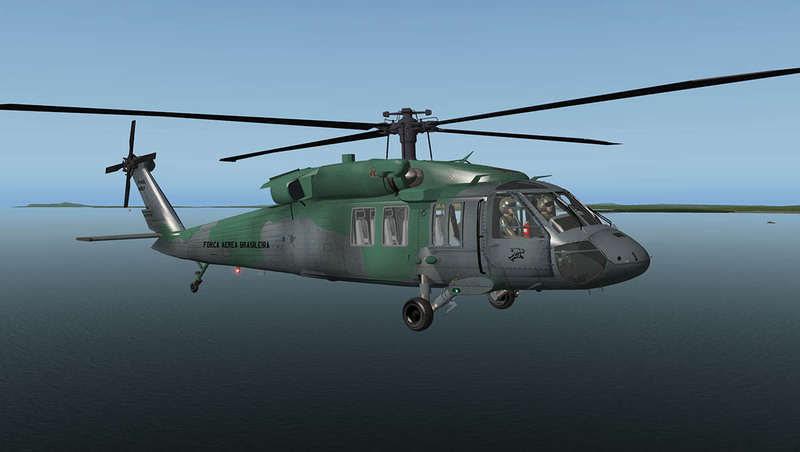 There are six versions of the UH60 in the package and all are separate aircraft in separate folders. This make for a large download of 979.30mb of which the add-ons to the versions are quite small. They are listed in the versions of with or without the radardome. First thing to note is that the aircraft is not sitting directly on the ground? 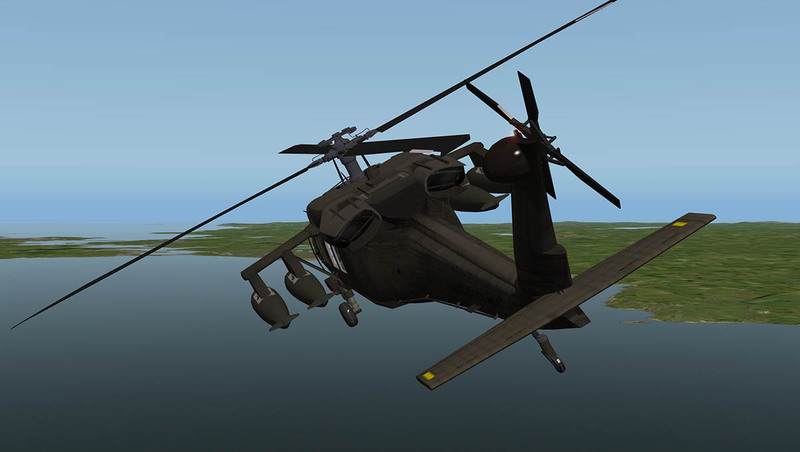 And it is not in the hovering mode either. 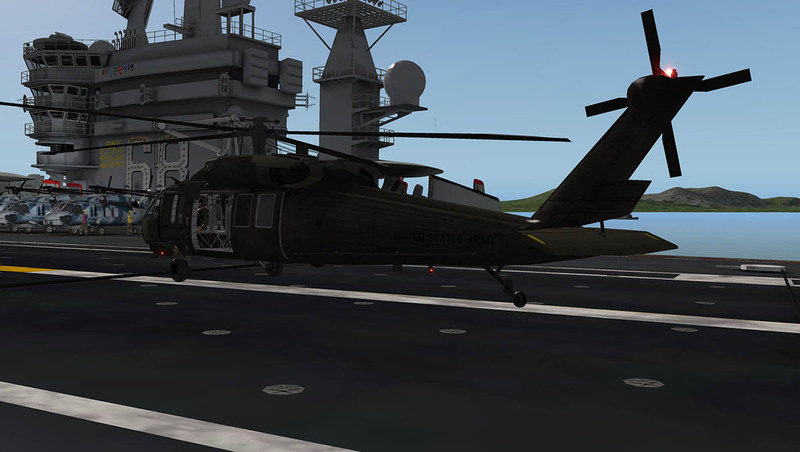 The UH-60 looks odd and feels odd in this view in that when you touch down, you are still sitting well above the ground. 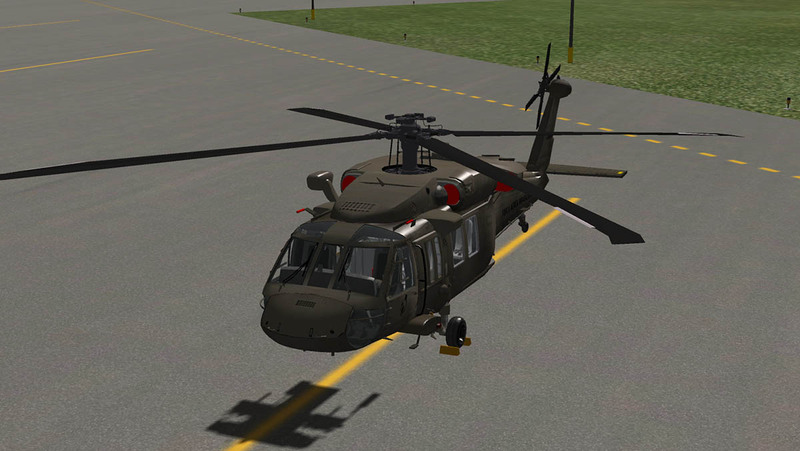 The shadow does not match the aircraft either? 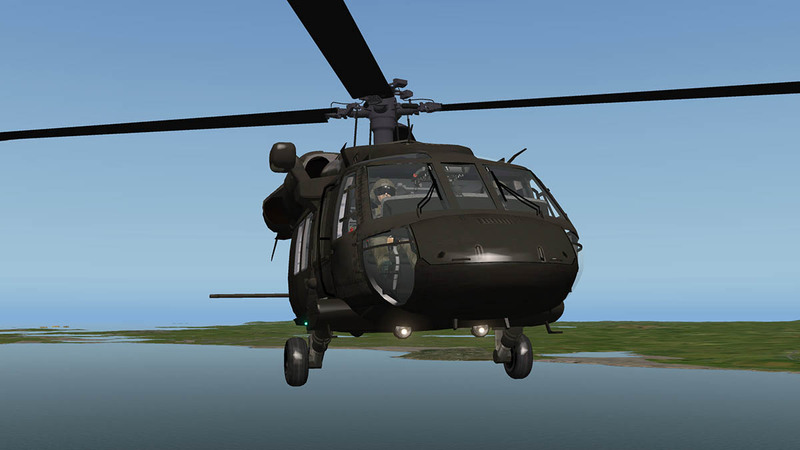 Helicopters in X-Plane have lately carved a niche of very high quality and features. In this area developers are on the top of their game and with every release you will find it very hard to find if they could keep rising to more higher and better heights, but they do. Into this scenario is the fact that any new developer is most certainly faced with an extremely high set level of quality and flight characteristics to compete with. 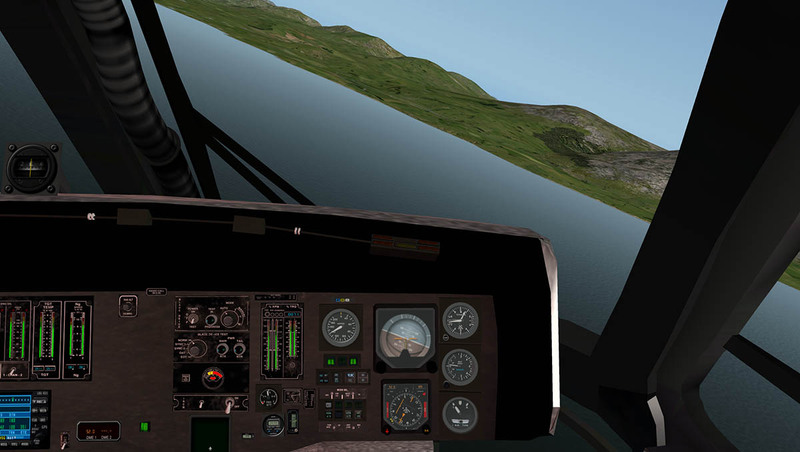 X-Plane is turning pro (professional), certainly in the payware sector and you have to deliver an aircraft that is expected to be at a certain level of quality. That said, any new developer has to also start somewhere, the pros have had a long development life of aircraft and learning and are expected to be at that level. 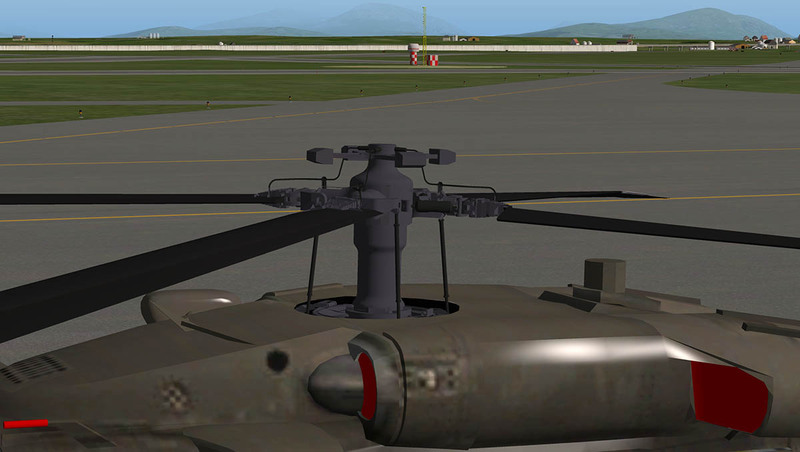 First born aircraft are always going to be a bit rough and ready and certainly in the high standard of payware. 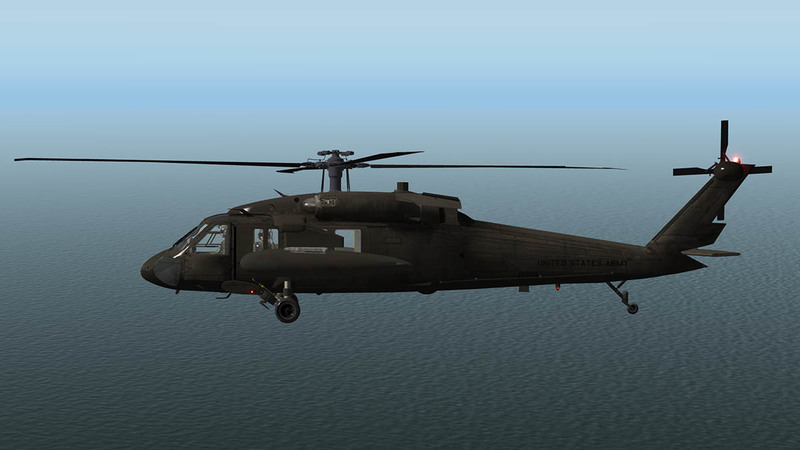 And that brings us to the UH-60 Black Hawk. 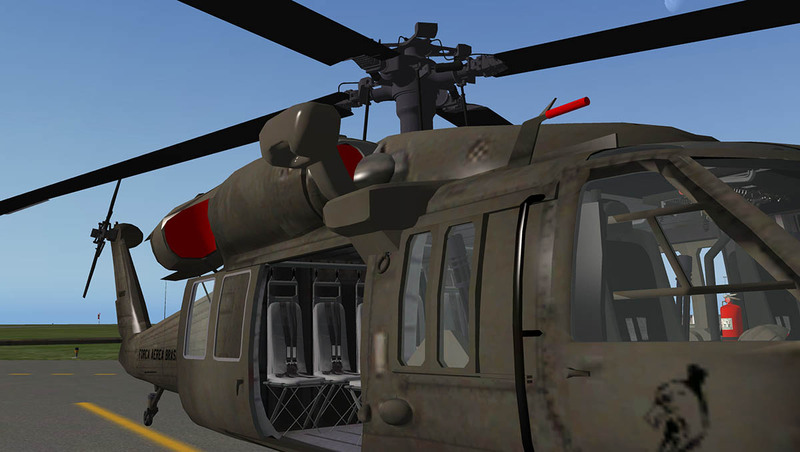 The basics are correct to a standard, but looking at the 3d modelling on the UH-60 it is a bit heavy and clunky, there is no finesse in the design here. and you can see it in the curves and the object shapes, some areas are fine like with the main panel, but many areas are just average and clunky with longer lines on the curves than there needs to be. Textures are poor in quality or even more in application, the heavy modeling soaks up your graphic memory like a heavy water tank, If you have 1gb in or more in graphic memory you should be fine, but it struggles everywhere else as the minimum comes in around 616mb which is way to high. 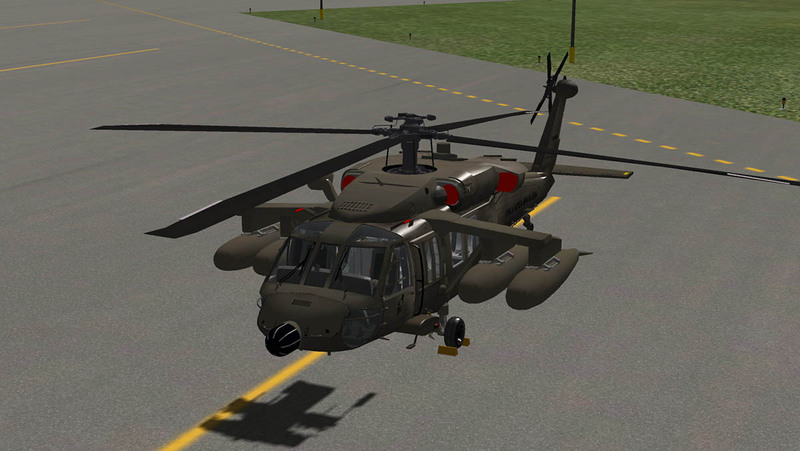 Adjusting the texture res right up helps a little, but not by much, the inside textures are still quite basic and poor. 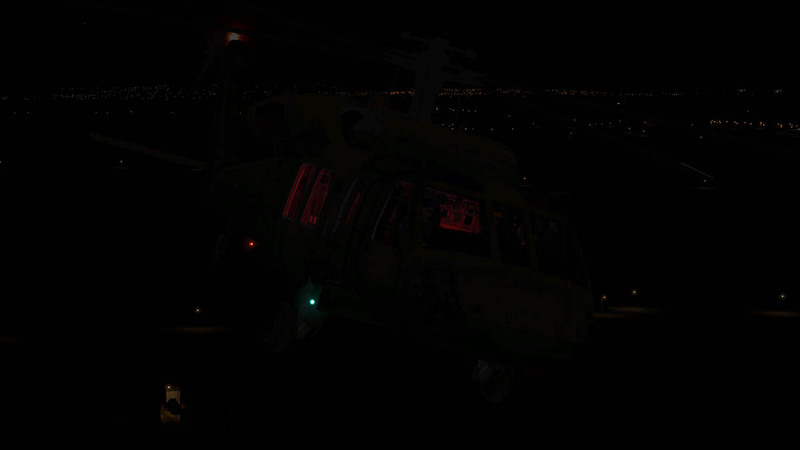 The aircraft is dark? 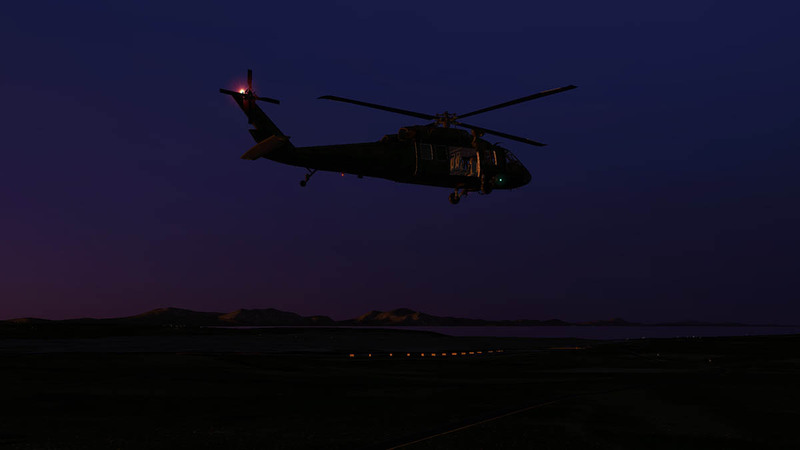 and hard to get light into, and the textures and liveries don't shine in quality on the surfaces, but the aircraft shines like a beacon. 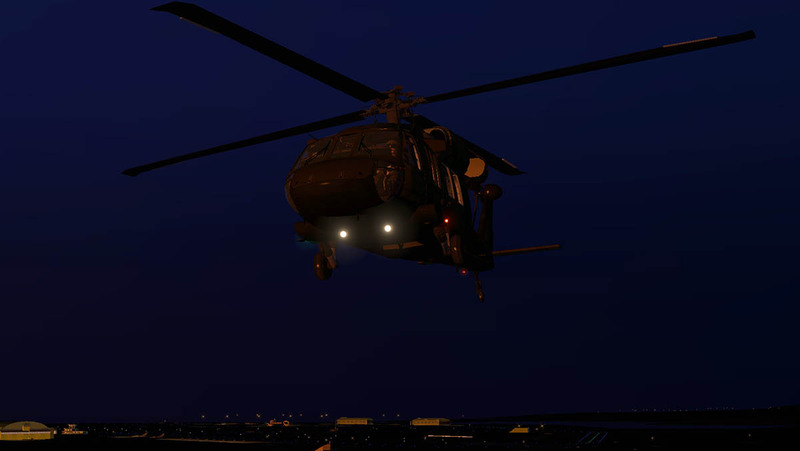 Switching on the "draw per pixel lighting" does not show any bump map highlights, which means there are no ridges or lines to reflect the light, and so the body of the aircraft is completely flat (smooth). 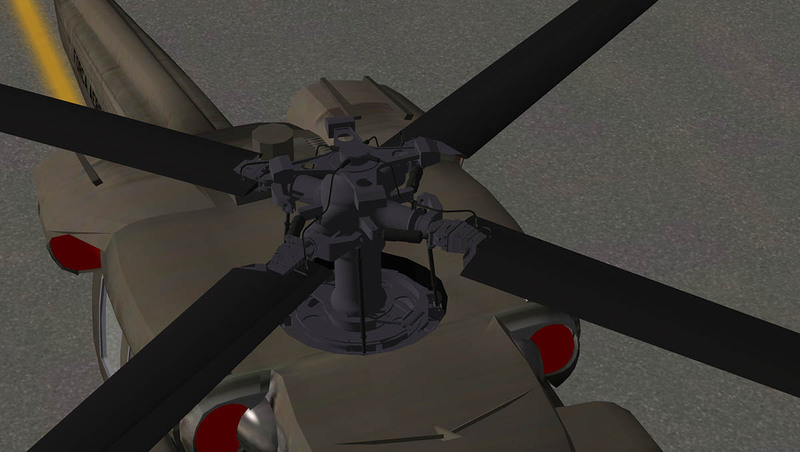 The front undercarriage is well modeled, the rear single wheel a bit spindly and moves with the yaw movements. 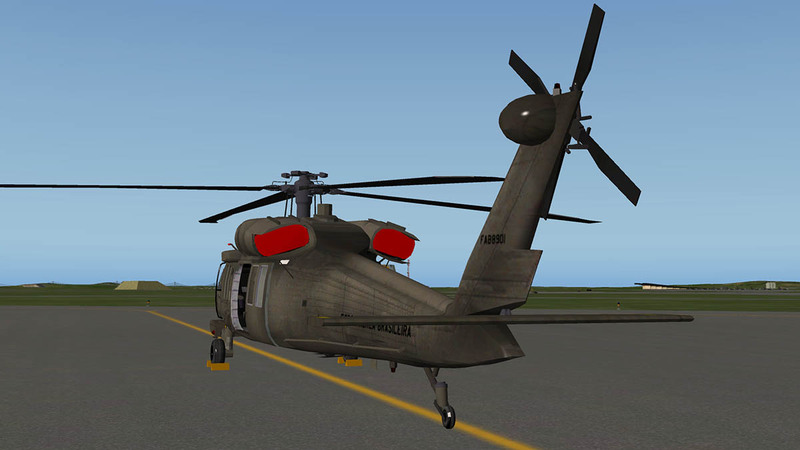 Aircraft power off will provide wheel chocks and engine, aerial/pitot covers (red) and external tags. 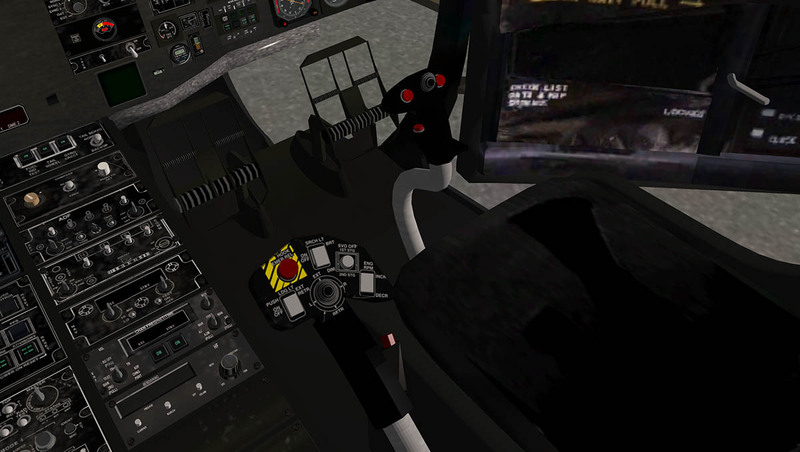 There are no menus, so features are opened and closed by buttons that are oddly placed, The pilot's door opens via a button on the joystick, but the side doors are opened via a required setting of a key or joystick command that usually opens the Flight_Controls /open_canopy (toggle), there is also no views feature. 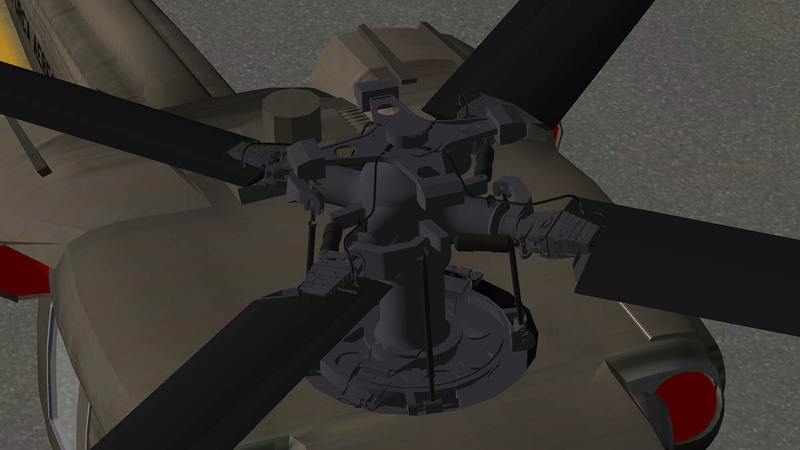 You can open the forward rear doors to allow the gunners to protrude out (gunship mode) via a flick switch "Master ARM" on the centre pedestal. 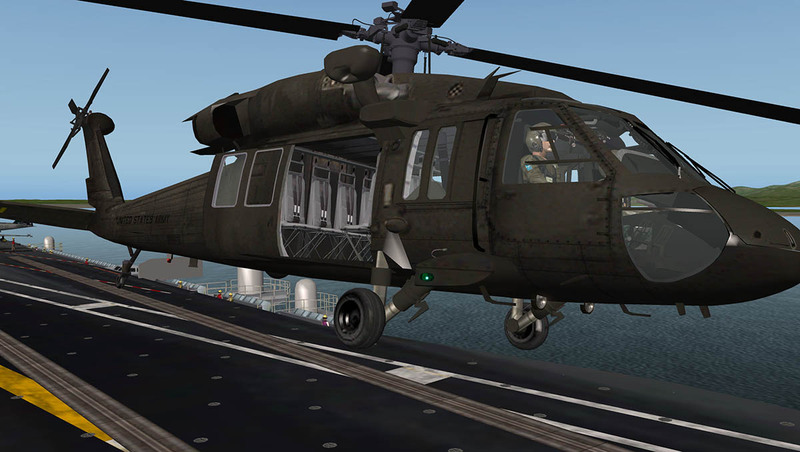 But like on the real UH-60 you can't have any slung tanks loaded as the gunners will fire straight into them. 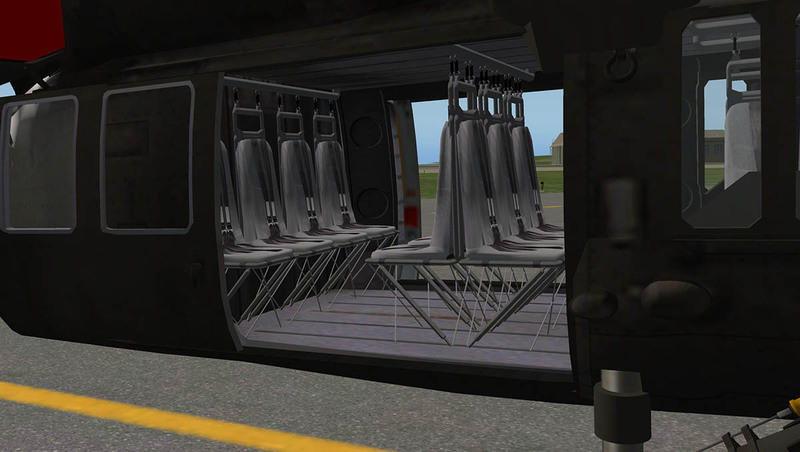 (In this case the gun nozzles will sit inside the inner tanks). 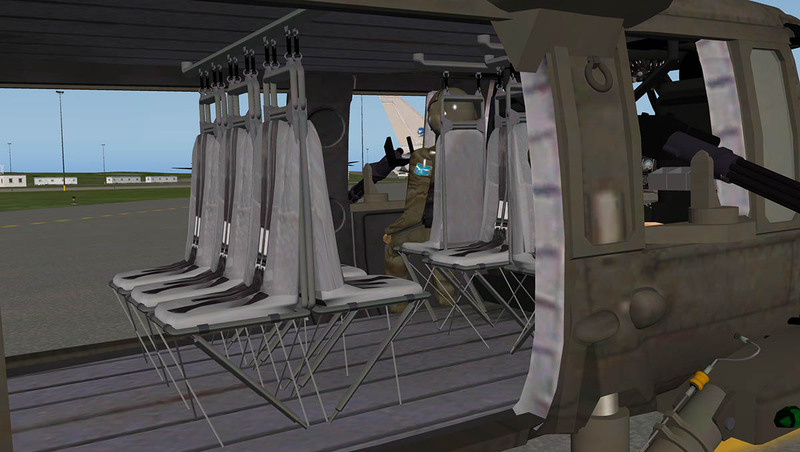 Inside the 3d work of the seating and internal fittings is quite good. So the fit out is great, but detailing like rear door handles (that usually activate the door animations) are missing. 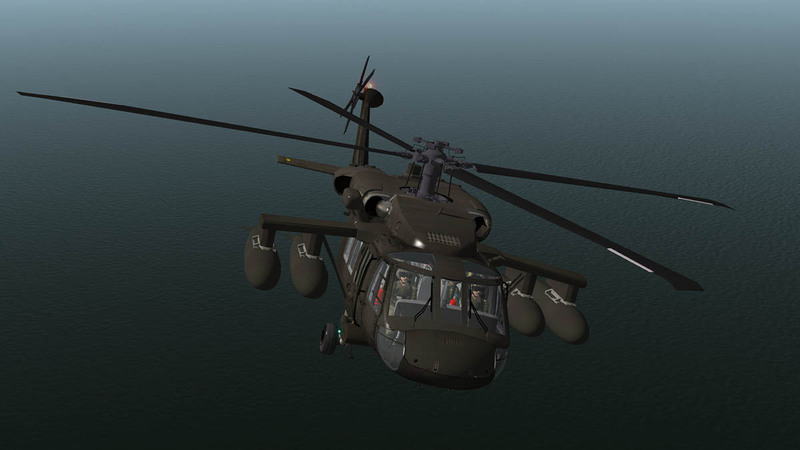 The actual rotor assembly is well crafted but limited in design. Movement in the collective is animated but in only in an up and down movement? The collective should twist the blades to change the blade pitch to give lift. The changing movement of the blades produces here a sag (when the collective is down) or an uprising of the blade when the collective is full, presumable to give that up swept blade effect when flying. 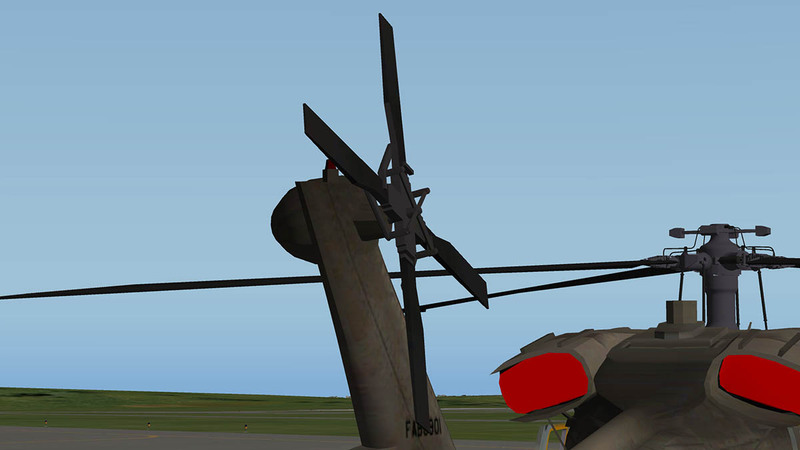 When rotating the blades don't look very natural in motion as they seem to be out of sync. 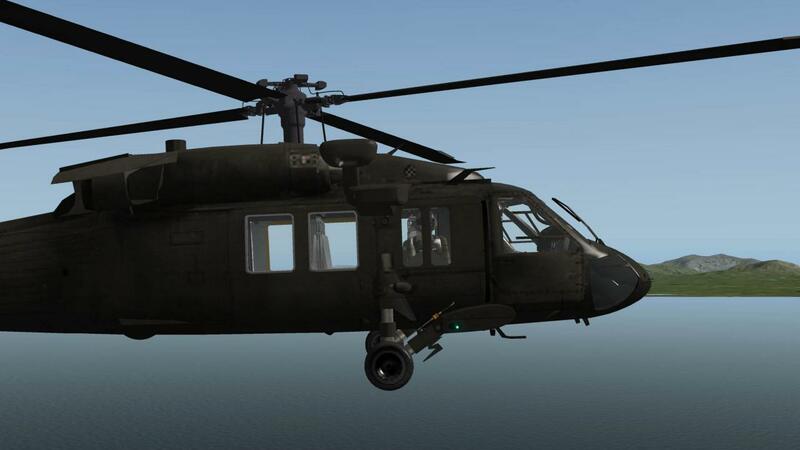 The whole main rotor assembly won't adjust as well for the pitch or side movement and the rear four blade propeller is fixed?... 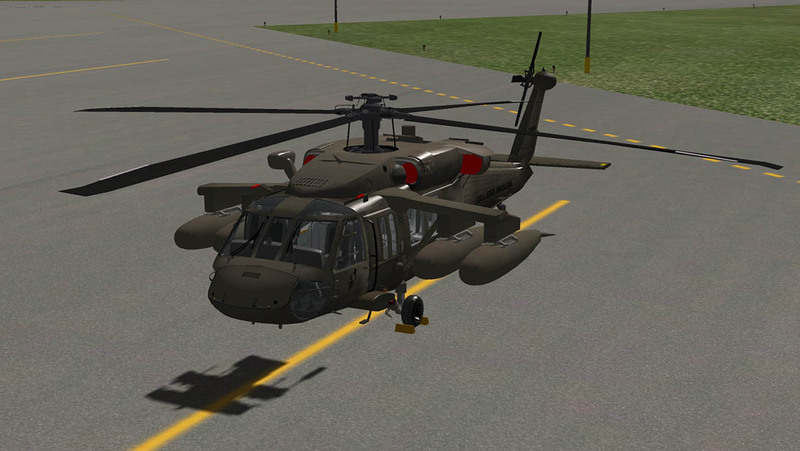 with no yaw animation. 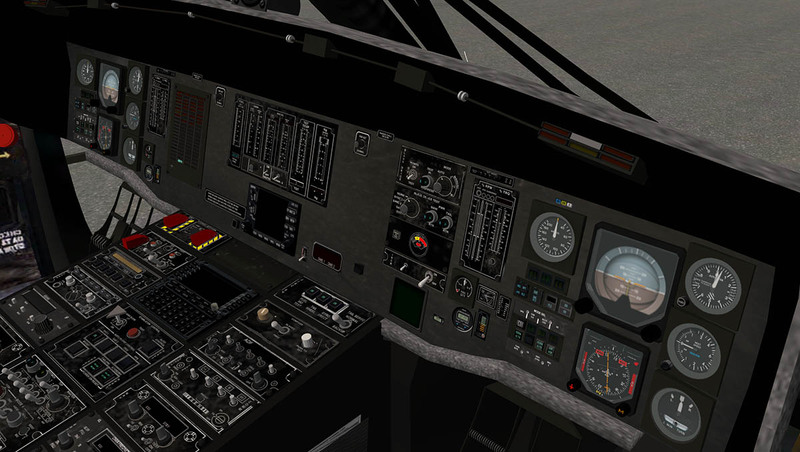 Inside the cold cockpit the panel is quite good and realistic. Depending on the resolution setting, the instruments are very good to average. 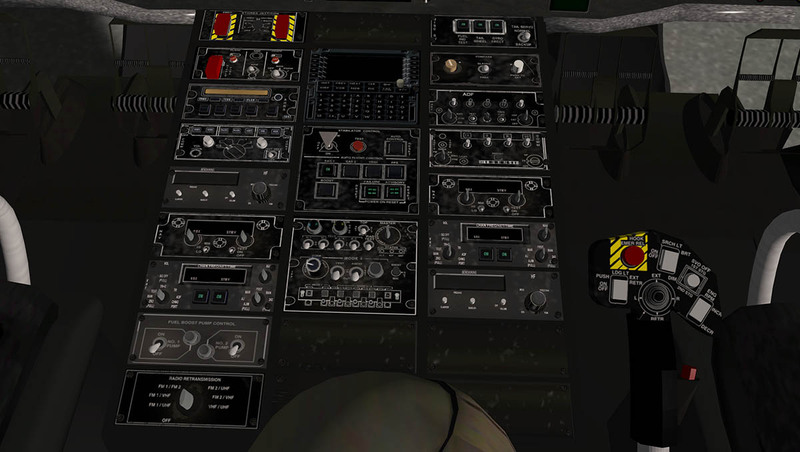 Many of the switches work, but many don't and many of the knobs don't rotate when you move them with the manipulators and look quite artificial on the overhead panel, and some manipulators only work in the )+ and not the -(. 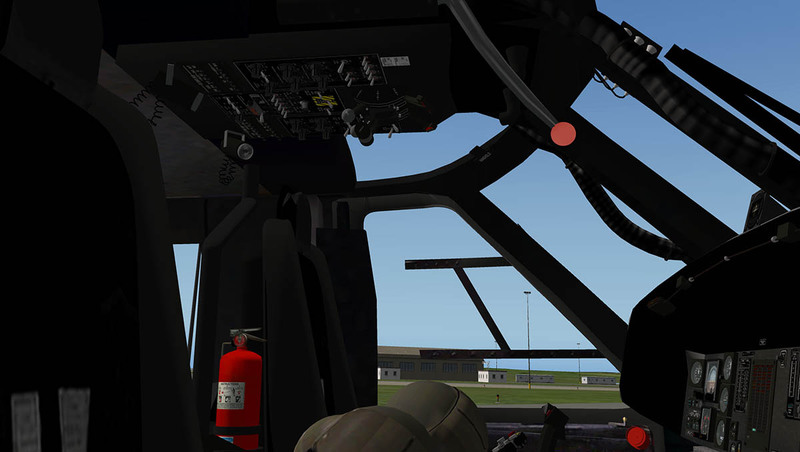 On the pedestal are the Fire extinguishers, Drop tank control, Master arm (gun mode), Chaffs and Flares, Autopilot VNAV engage, NOE flight mode, FLCH flight level change mode and engage buttons and indicators, COMM 1, COMM 2 and NAV 1, NAV 2 radio, flight director, XPDR (transponder) ident and code switches, Fuel boost/primers and FMS (Flight management system). 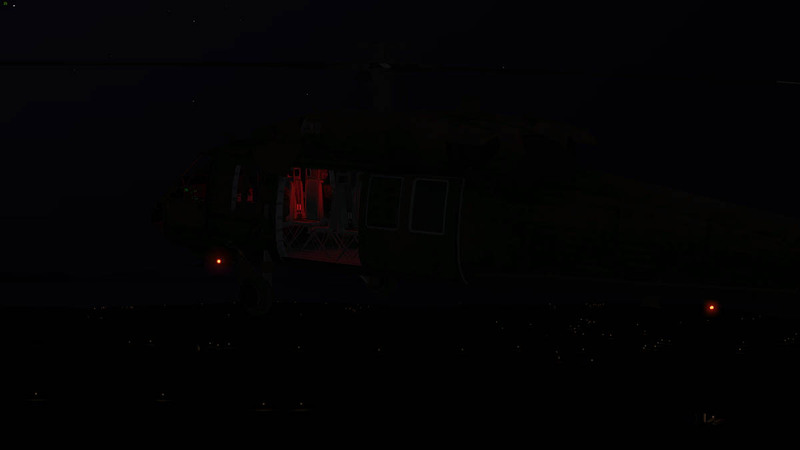 The search lights and landing light switches are on the collective. 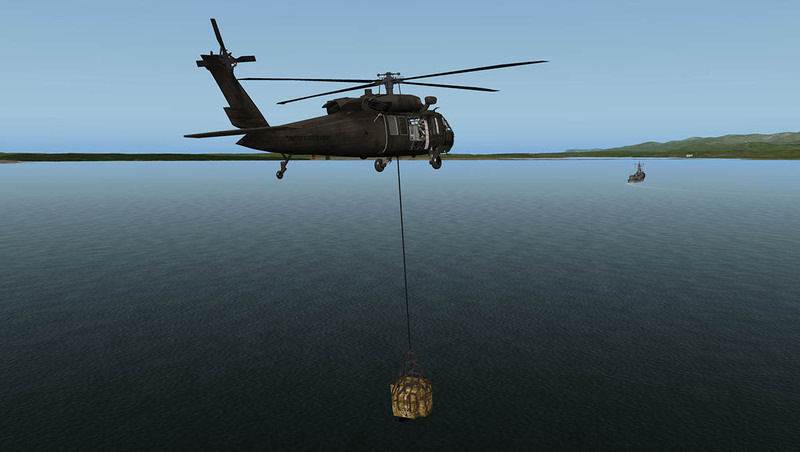 On the cyclic are three buttons for opening the pilots door, Hoist and crew member or Helicopter Rope Suspension Technique (HRST) and far right a slung load. Overhead panel has Navigation/Beacon/Strobe lights, backup pumps hydraulic pumps, APU start button, Avionics switch, Battery switch Generator switches No.1 and 2, Fuel levers and Engine RPM, Fire extinguishers, Windshield wipers (2 speeds), Cockpit/Instrument lights, Pitot heat (annoyingly always in the off position) Ignition buttons, Inverters, Windshield heat and Engine de-ice. 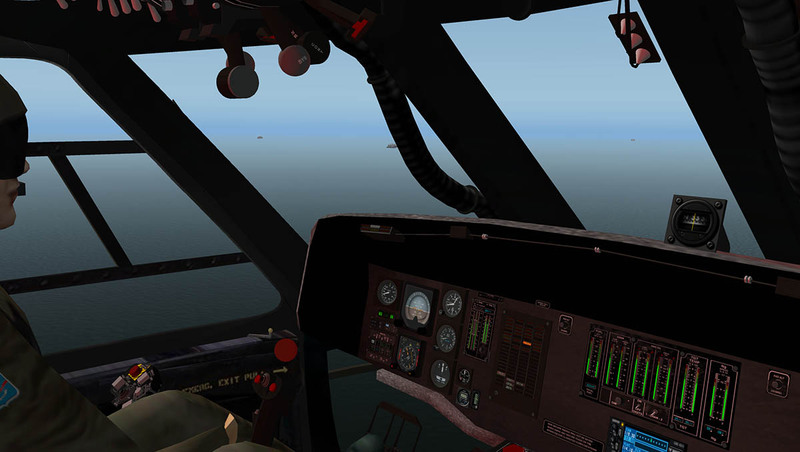 Engine controls are straight on or off, and have no idle position. This is annoying as well because if you like me do always do a landing too collect your crew or cargo then you just lower the power to idle while the work is happening around the aircraft, certainly if you are transferring on board ship or on the ramp, then you power up and fly away. 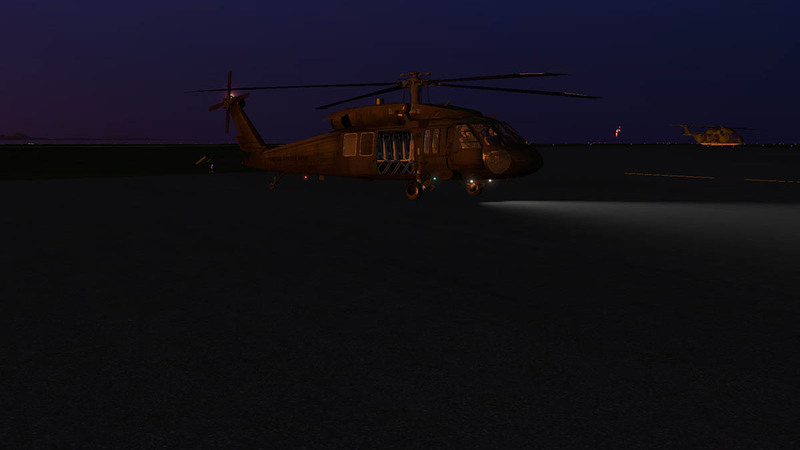 I powered down the UH-60 and it just wound right down to a stop, and then the aircraft had to be totally restarted? Just leaving the ground you know something is not quite right about the flight model? Push the cyclic forward and the the attack position of the pitch down does not happen as the aircraft goes flat?, Helicopters work by the lift of the collective and changing the pitch of the rotors in the direction you want to go (forward, back or sideways), here to get more forward speed in if you put the tail down? 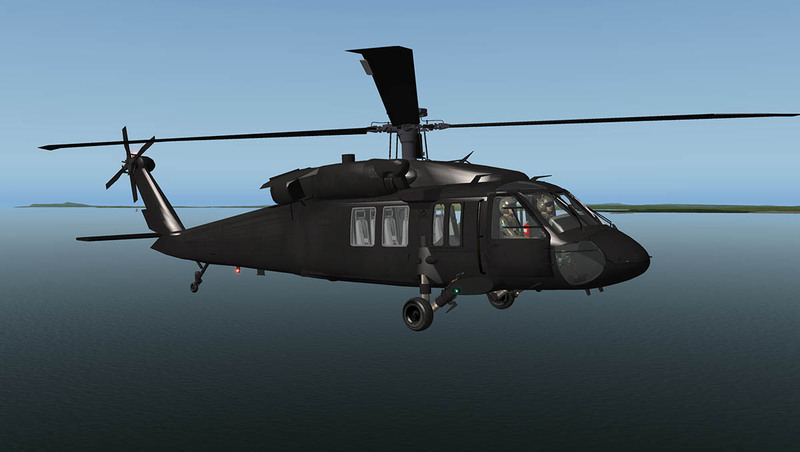 The Black Hawk does have that huge whale tail stabiliser and its job is to keep the aircraft in a level attitude in flight. 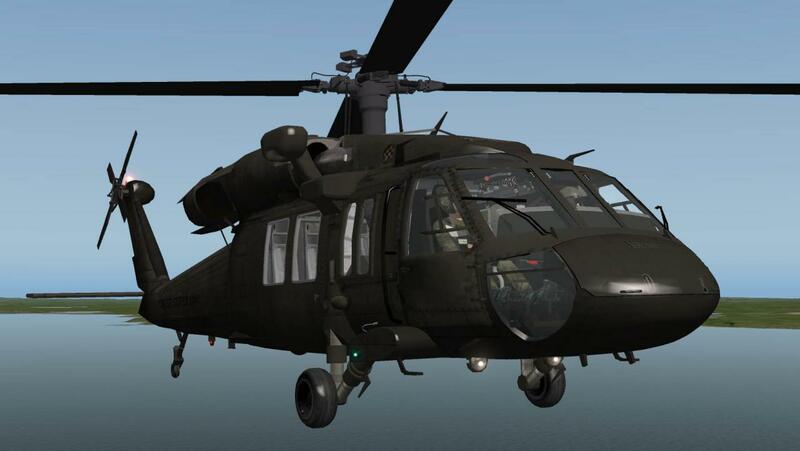 But you can't right off the basic helicopter flight characteristics to that aerodynamic aid. 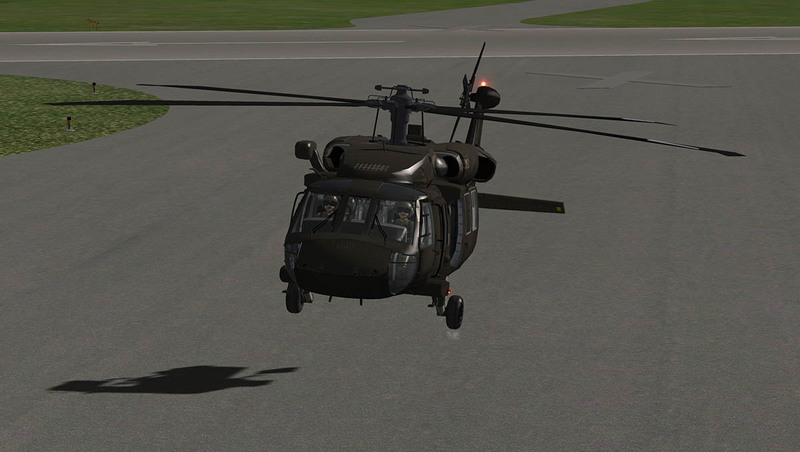 Leaving the hover and forward flight and the tail will flip to the left without adjusting the yaw? This effect will come back when coming off the power (say in a descent) and then you will get a series of shudders to the left from the tail. 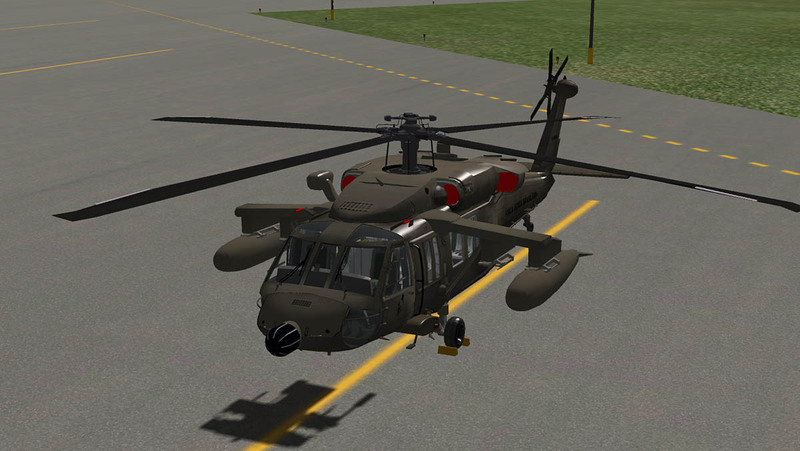 In the hover it can resume its slight tail shudder that shows the flight characteristics are not tuned. 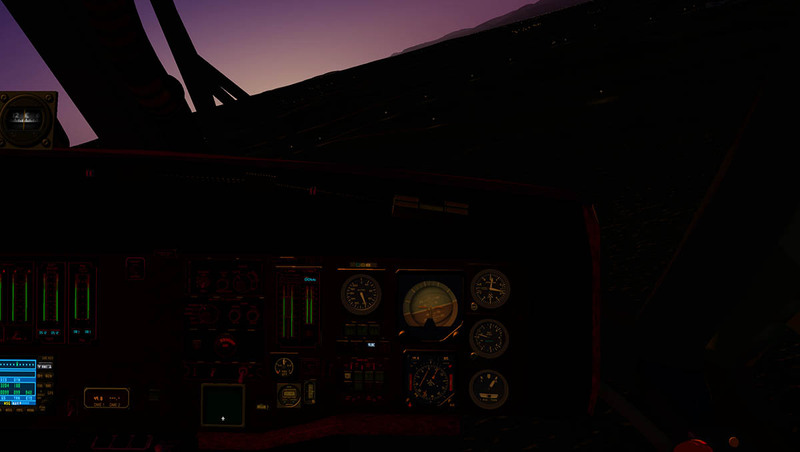 So all through the flight modes you are aware of the drag modeling is simply not correct. 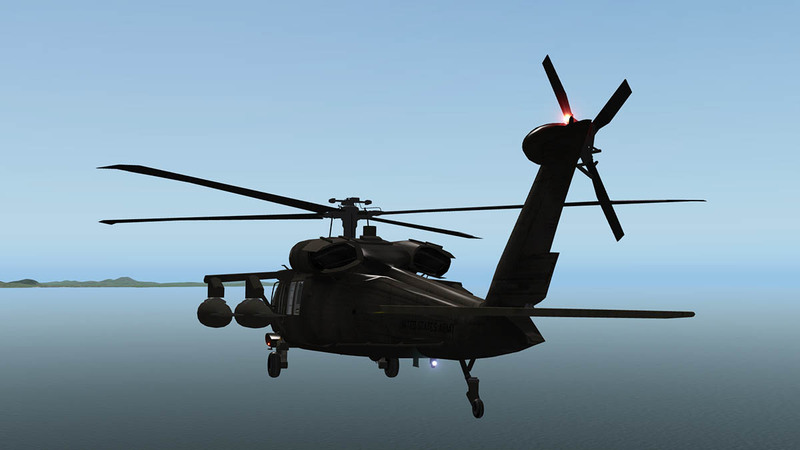 After the Auto-Rotation in the hover mode the aircraft is not to bad and you can land it quite easily. 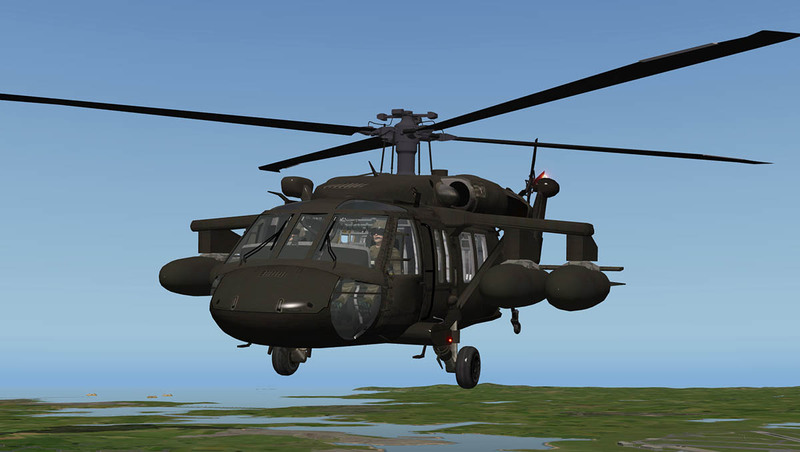 I would note it as an Arcade Game type of flying than real simulation flight, and many users would enjoy that type of flying. 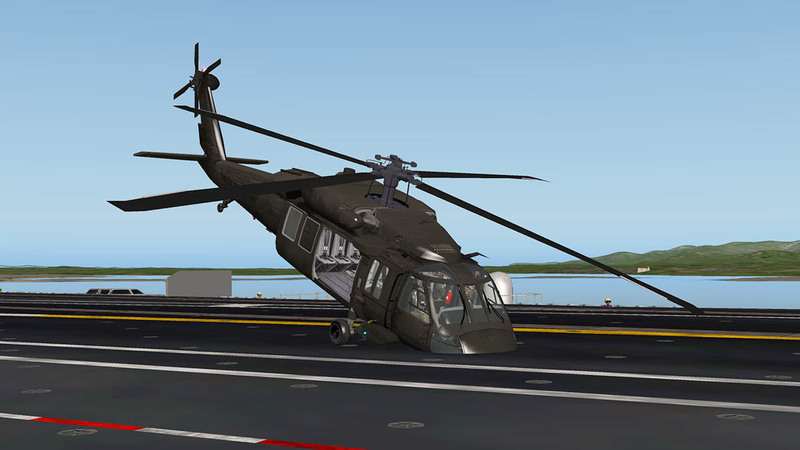 So landing of taking off from the carrier is quite easy, but staying on the deck is slightly harder in the fact that with the collective full down the aircraft wants to tip forward nose first (no idle remember) so the only way to keep the tail down is to keep the cyclic full back? The main instrument panel is quite basic, with the Standard Six instruments for both the Pilot and Co-Pilot and the rest a nice sets of vertical parameter LED's, One set for each pilot is for the RPM and TRQ (Touque) but the engine & rotor gauges aren't actually properly calibrated and are the incorrect settings, and the digital torque does not match the readouts. The centre batch is for Fuel - XMSN - Engine oil (X2) - TGT Temp - Ng Speed. There is a comprehensive warning panel with an annoying "Lo Rotor" warning that can't seem to be solved and the warning whining sound means you have to either turn your sounds off or suffer it. lower centre is a standard Garmin GNS430 gps (not the 10.30 version) that is stretched vertically to fit the panel. Sadly you couldn't use many of the buttons or indicators because the text was out of shape or simply non-readable. 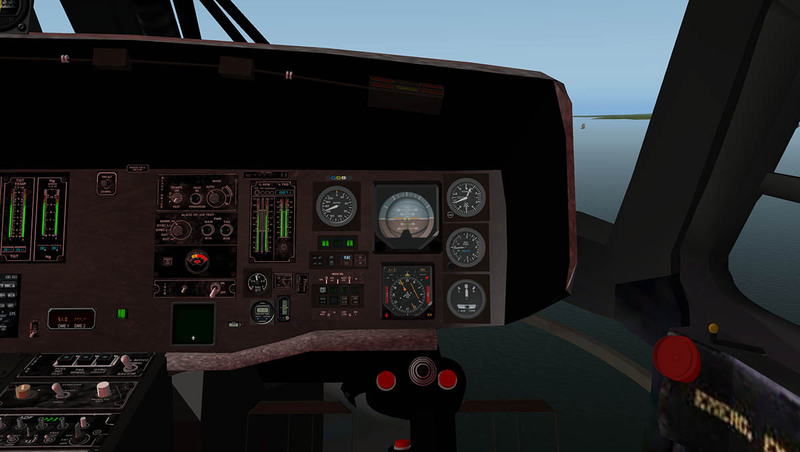 The autopilot is basic and works well with the aircraft at a slight tilt to the right, but you have to set the SAS2 and FPS before using the LNAV or VNAV modes. 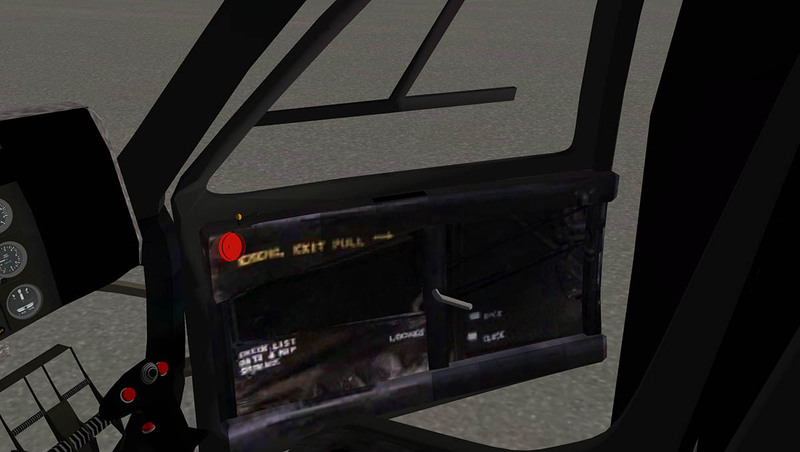 If flying in the rain then the wipers (2 speeds) are not connected to the glass and the blades will sweep over each side of the glass. Livery quality is poor and you will need a high resolution setting to get any life out of them. 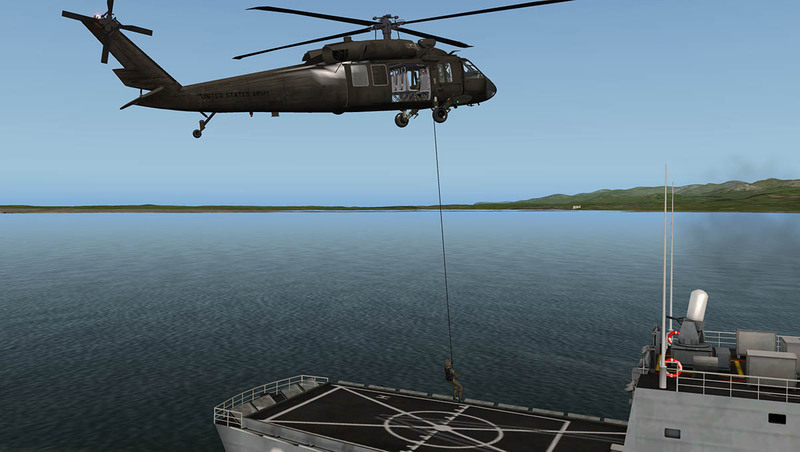 You can use the underfloor hoist to carry a cargo load and the side hoist/winch to allow the (HRST) team or a single crew member to be lowered to a ship or landing position. The line below is quite straight so if you turn the aircraft at an angle the bugger on the bottom end will move in line with the aircraft. 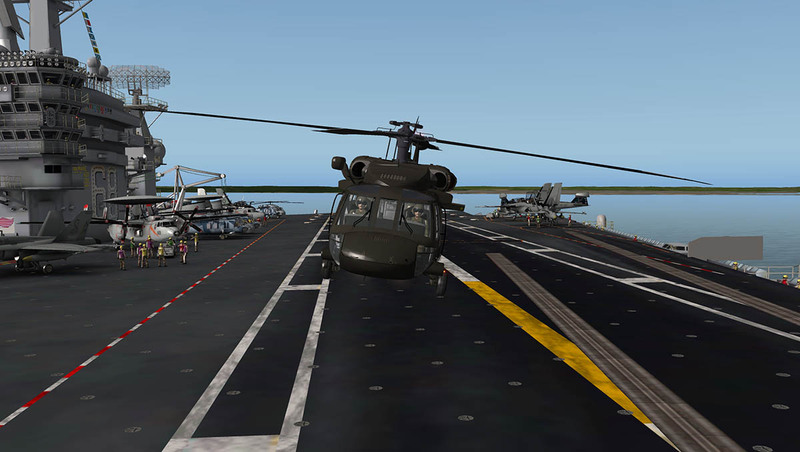 But as features they are both fun in the right context with like I did here in transferring crew and cargo to the Perry Class frigate from the USS Nimitz. 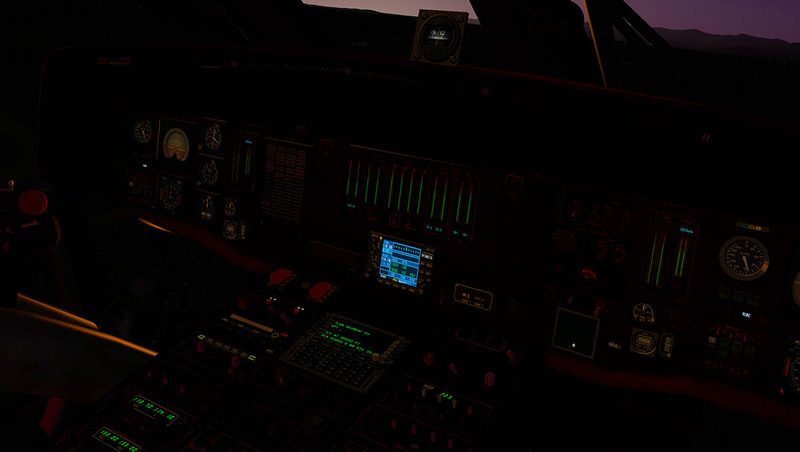 The red lighting in the cabin looked and felt really good, and overall the lighting was not to bad, The Strobe (red & white) felt a little too large, but the Nav lighting was fine. You can adjust some lighting on the OHP (two out of four) and that cast a nice red glow on the panel, and the Standard Six instruments felt a little dull... but I could not get the OHP to light better either. 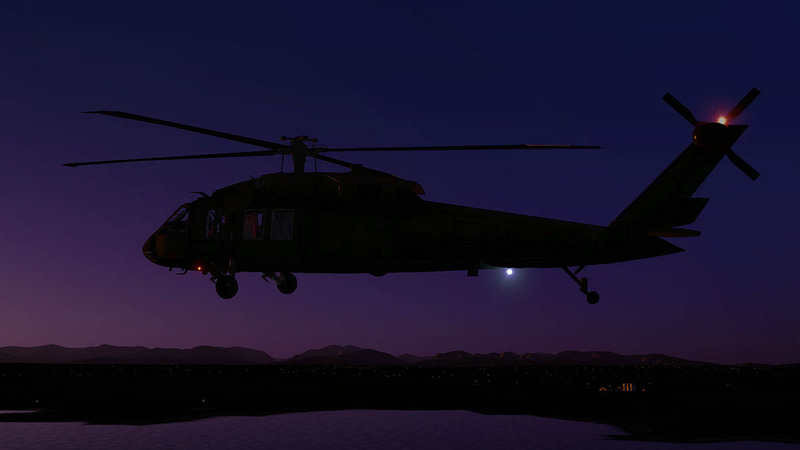 There is a spot light and landing light under the front fuselage and are excellent for landing or close ground following flying. 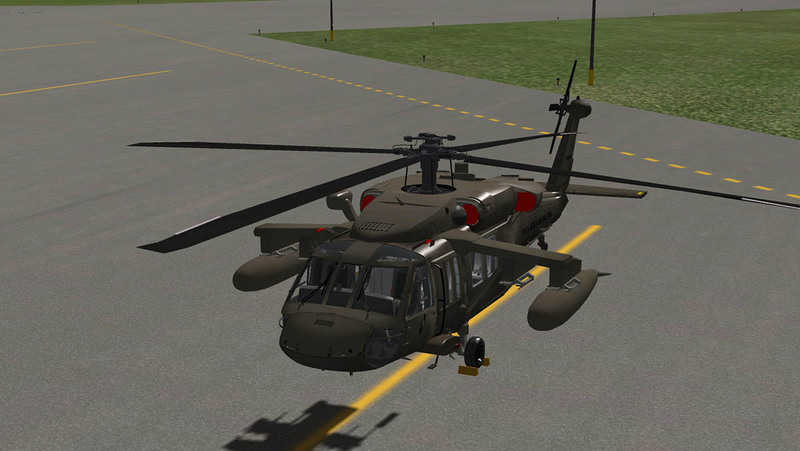 Many of the basics with the UH-60 Black Hawk are well done, but a good portion needs more far development to realise the aircraft's full potential and even in some areas a total rethink. I would rather it be out here though and seeing the aircraft get the attention (and fixes) required than sitting in development hell for years or simply disappearing off our radar. 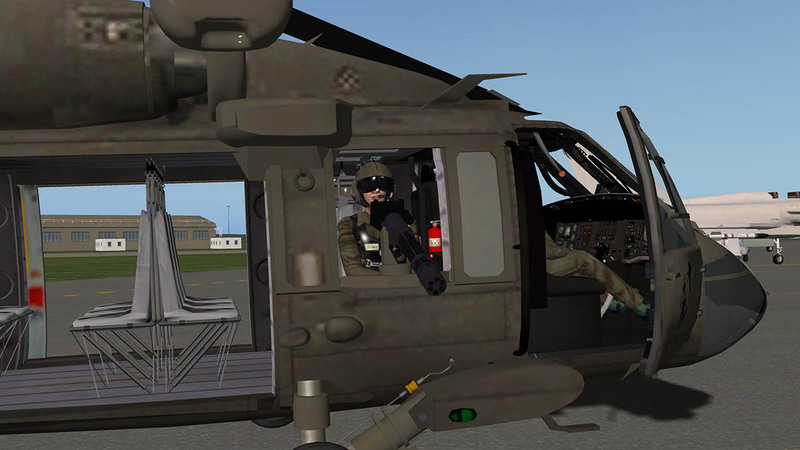 No doubt the UH-60 is a great aircraft and we in X-Plane want this aircraft in our simulator. 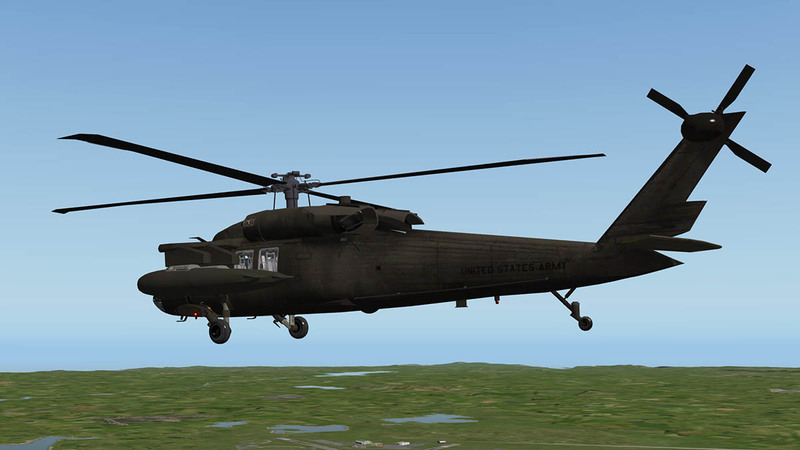 Like I noted is in that helicopters are at a high level in quality now in X-Plane and the step to level is very high, that does not mean that the UH-60 could not be sorted, In the short term the flight model needs a complete overhaul and the textures need to be more efficient and have better quality with also big reducing the overall size of the files (graphic use is far too high or inefficient for the size of the file). In the long run it requires a menu system and a better way of adapting the features with a one model + extras than the current each model for each version approach that adds to a huge download file. 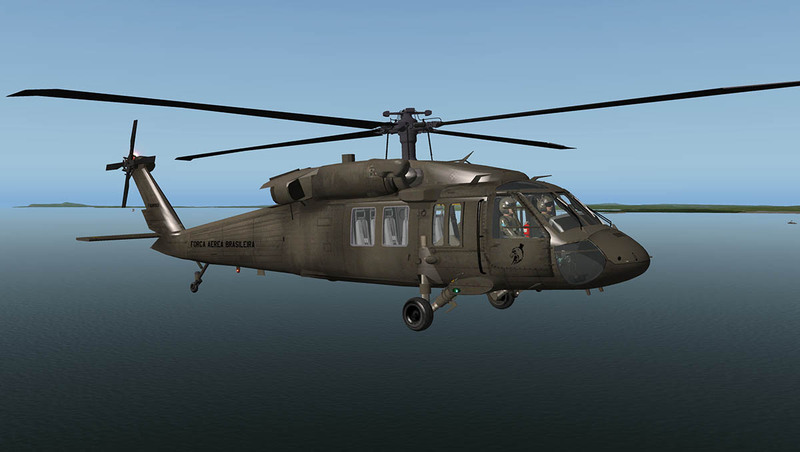 Yes the UH-60 looks like a Black Hawk and yes it is a great aircraft, and if you approached it as a arcade game to fly around in doing missions then you would get a lot of fun out of the aircraft, but for the serious helicopter pilot you would find it wanting. Download is a hefty 979.30meg to an expanded 2.08gb! 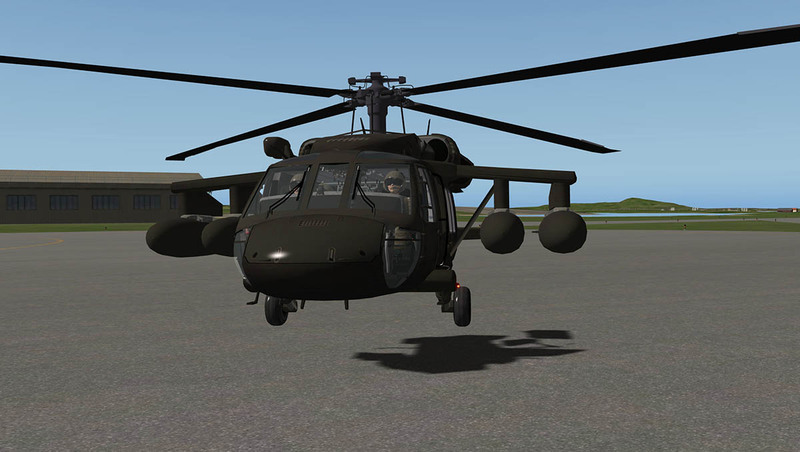 that is positioned in your X-Plane "helicopter" aircraft folder. 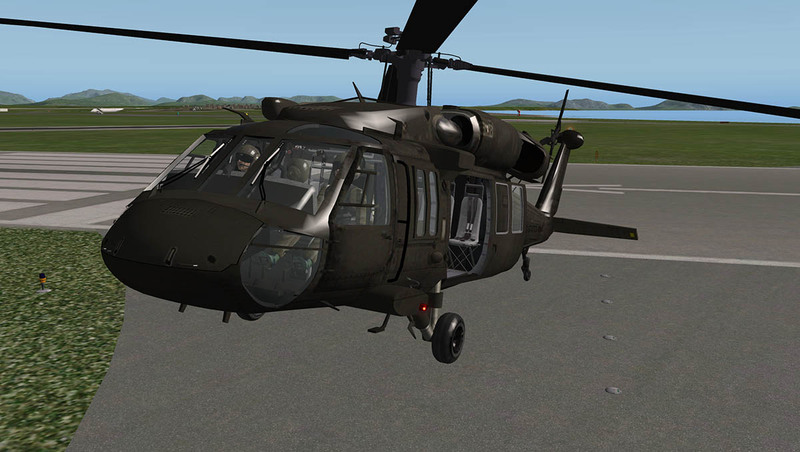 (each version is separate and each version will require (X-Plane) view settings to be applied to each aircraft. Documentation: Pilot Operational Handbook - Manual is 25 pages. Just bought it and it looks like v1.1 is quite different from the one you reviewed? Single download for starters and the wheels touch the ground!